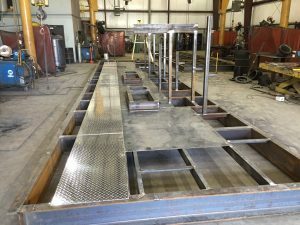 Custom Metal Fabrication | Carbon or Stainless Steel | Pressure-Tech, Inc.
We fabricate any type of custom metal assemblies. Materials include carbon steel and stainless steel. 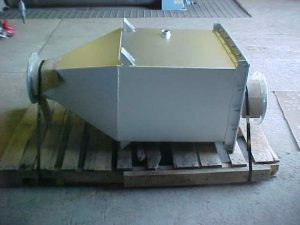 Some applications include, but are not limited to, Platforms, Railings, ladders, steps, saddles, almost anything fabricated of metal. The only size limitation that we have is the 20,000 lb. weight limit. We currently utilize the following weld processes for Carbon Steel & Stainless steel. Flux Cored Arc Welding (FCAW), Gas Metal Arc Welding (GMAW) & Submerged Arc Welding (SAW), Gas Tungsten Arc Welding (GTAW-TIG) & Shielded Metal Arc Welding (SMAW). 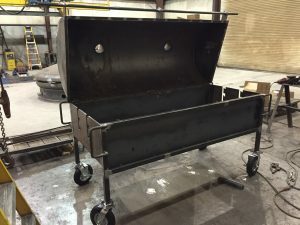 To inquire about custom metal fabrication, give us a call at (717) 597-1868 or email us to get a custom quote.